William Simpson (1823-1899) was a Scottish artist in south Asia in the 19th century. 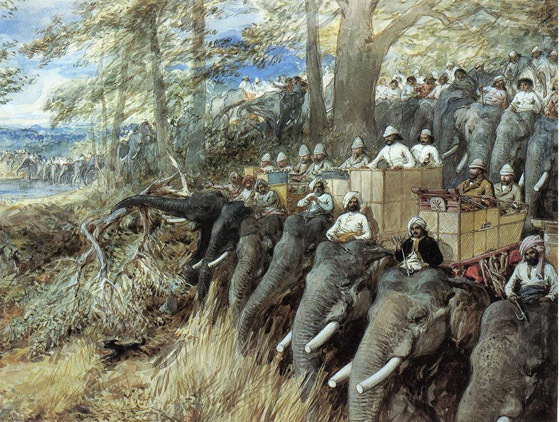 This watercolor painting shows a vintage tiger hunt as the Prince of Wales beats the jungle with Sir Jung Bahadoor in the Nepal Terai. Simpson was an eyewitness to many momentous events, and several times found himself under fire. One time at Balaclava he kept sketching while being shelled. He had a strategy for dodging bullets. "If a shell is coming to you," he said, "it becomes instantly visible as a black speck against the white smoke of the gun which fired it, and before it reaches you, there is plenty of time to go under cover." "a black speck against the white smoke of the gun which fired it..."